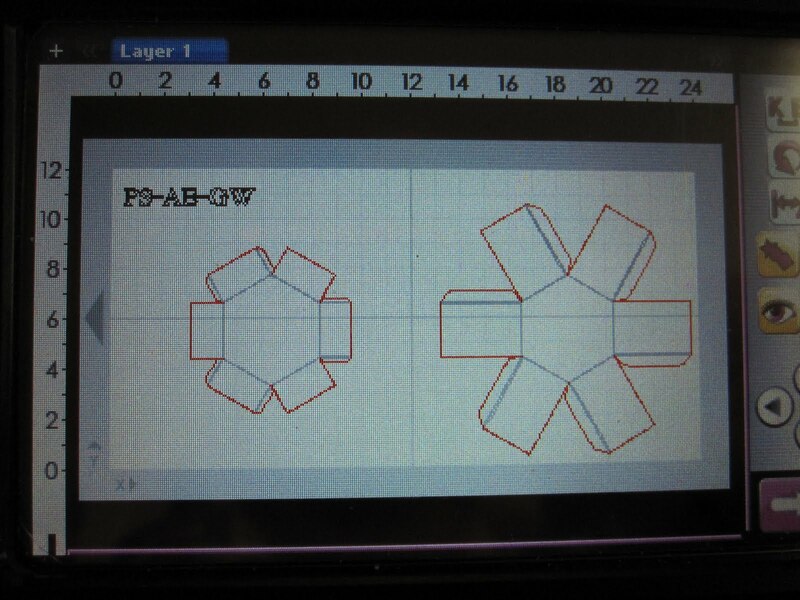 f The Bugbytes: Hexagon Box With Sass! Hello, this is Sheila aka SassyLady from ShesASassyLady and I would like to present this wonderful project just perfect for gifting. I guarantee you will want to make this little box over and over again. What a wonderful way to present a gift. 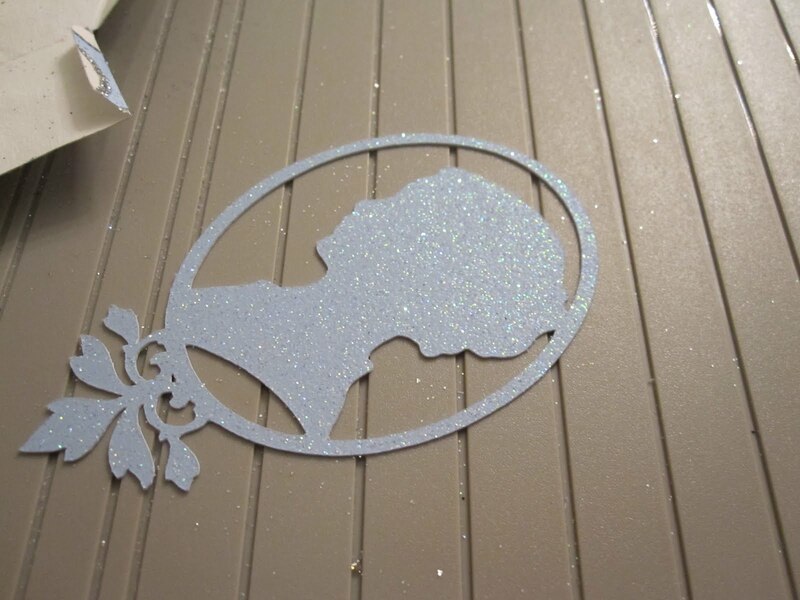 My thanks to our very own MyaMagoo for this design at Design~Create~Inspire. My employer scheduled me with no days off for this week and last other than Sunday. This left me with many projects to complete and not enough time... I emailed, asked, and Crystal came to the rescue with her very own Hexagon Box. And it cut perfectly! 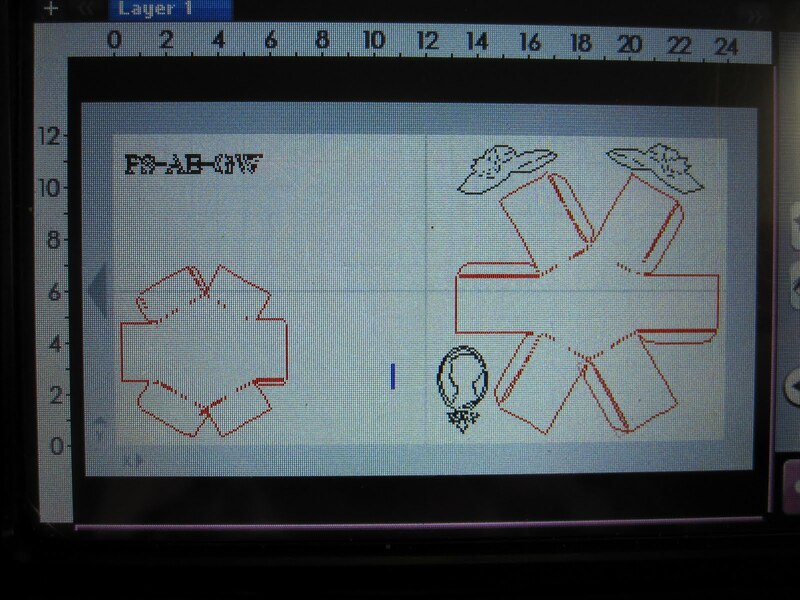 All you need to cut this design is GW, PS and AE. I used Heritage for the Cameo for my design and Forever Young for the hat which I used as a gift tag. 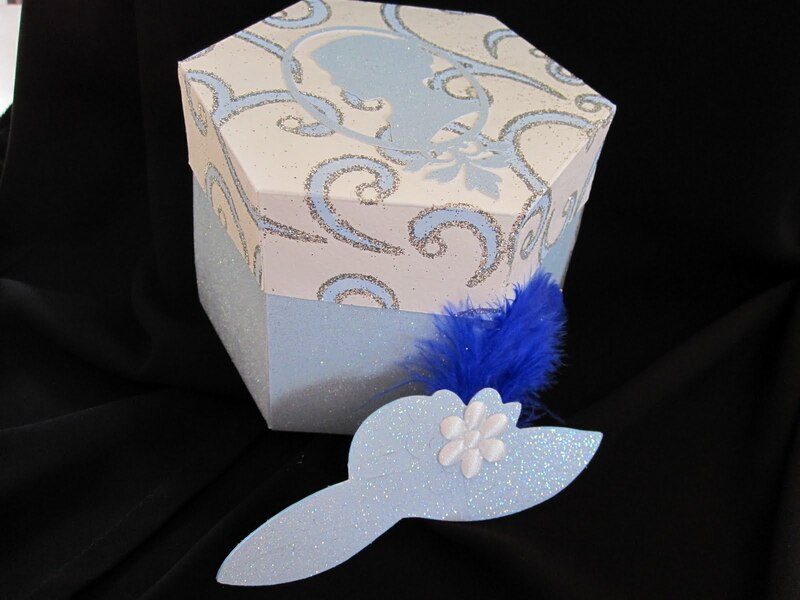 This gives it a look of a ladies hat box. 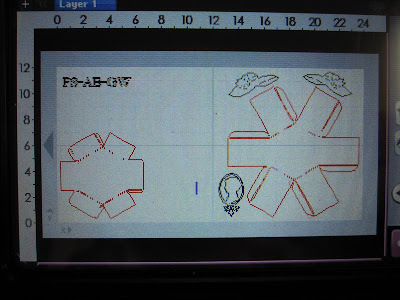 This is the design and I have touched the preview button so you can see how it is actually going to cut while allowing you to see the complete design. (Note: if you download this file just be sure to delete the cart letters on the top left or they will cut too.) 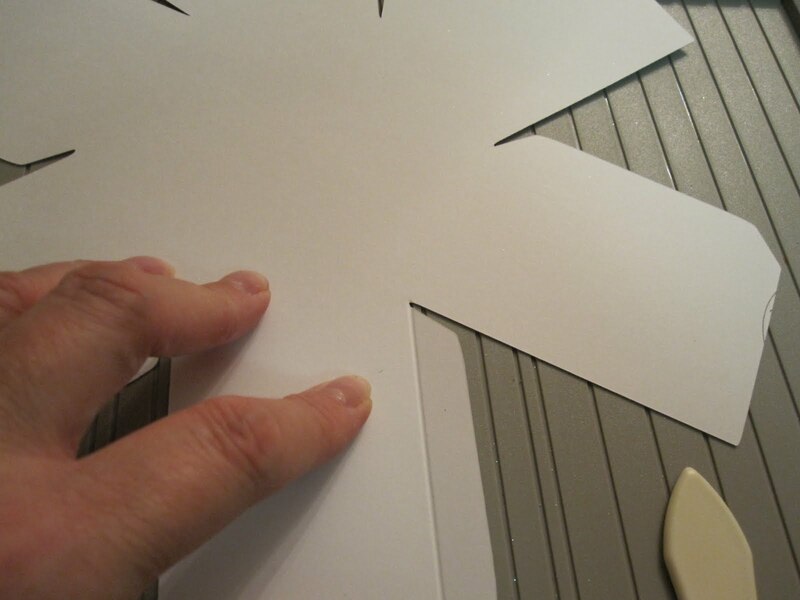 I knew by looking at the design this would cut perfectly so I didn't even try a test cut! All I did was add a Cameo and the Hat and it was ready to cut... I didn't even save that as I figured what ever the occasion, whom ever the receiver the art or decorations will change for that person. Aren't these papers yummy? 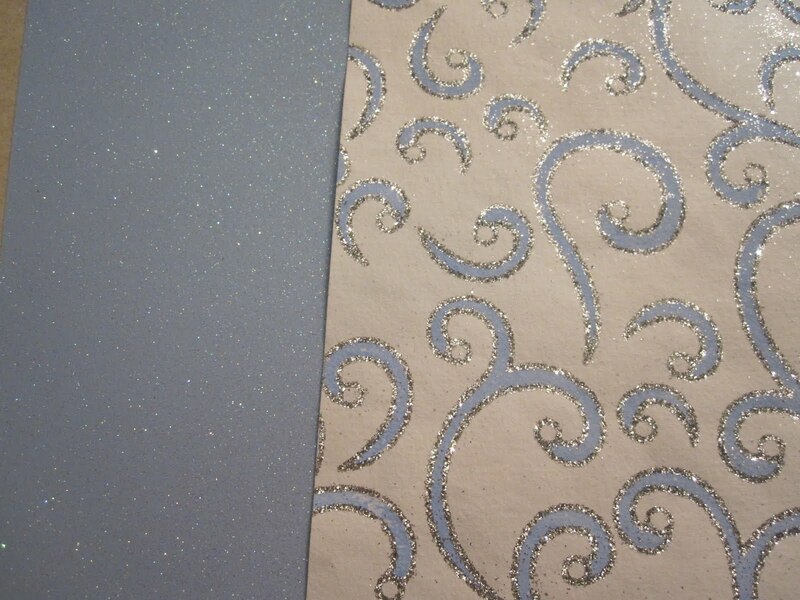 Hobby Lobby has wonderful designer paper for $1.99 per sheet that is just awesome.... be sure to buy when on sale or you have a coupon. This is a very important step in this project... scoring. You really need to take the time to score properly for this design to come together perfectly. 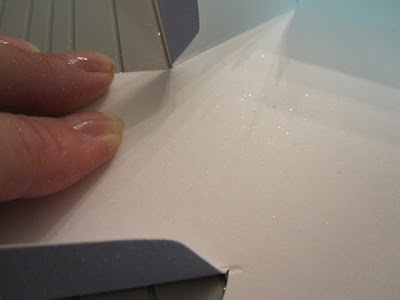 After you score be sure to fold and crease the edge as shown so it comes together with clean crisp edges. 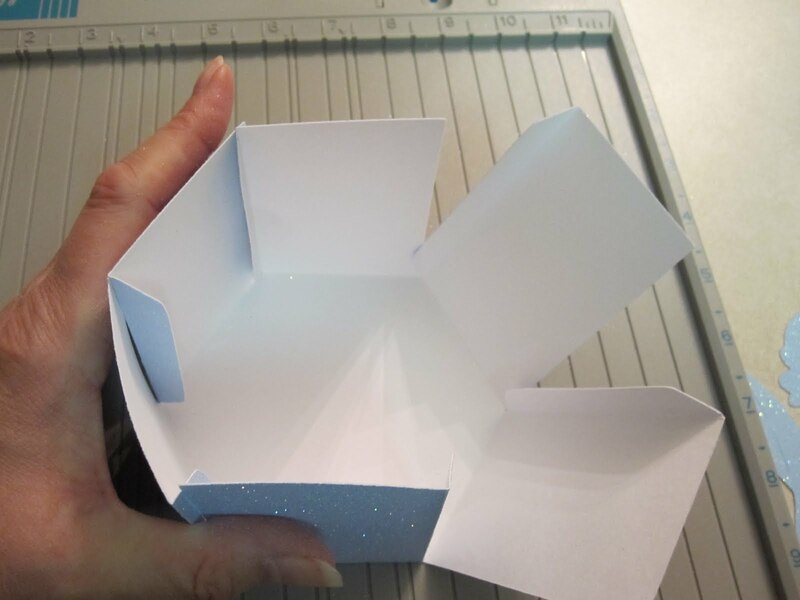 See how every side edge is folded and ready. 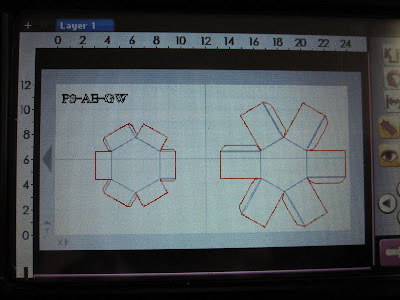 Then I did the Hexagon. Take it slow and concentrarte. There are no score lines as you really don't need them. Just score from edge to edge on each flap, as shown below. 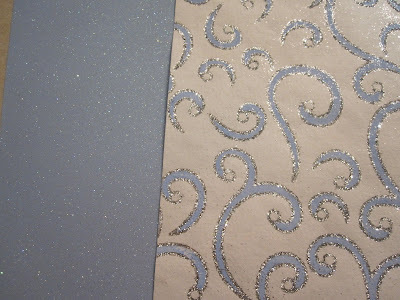 Now I used a heavy glitter paper so I recommend Zip Dry Glue for that, your ATG tape will not hold on glitter paper... I tried, it will not hold. 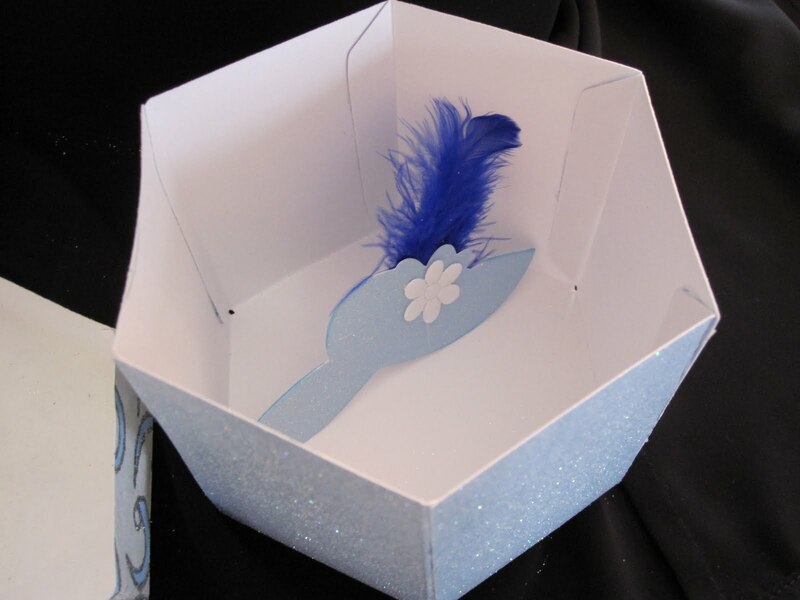 Do the same process for your lid but before glueing together be sure to add any decorations on the lid while you can still lie it flat. 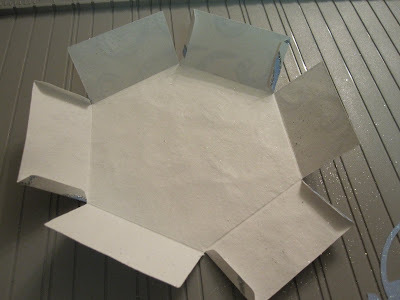 Then place glue on the edges and bring up the sides. Because my top was mainly paper I put it together first and let it dry. Then after I put the bottom together I placed the lid on it to hold in place while it dried. 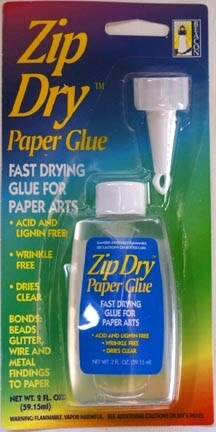 Make sure you don't have any excess glue from the bottom touching the lid though or you will not be able to get them apart. I used the Zip Dry to adhere the cameo to the lid? It looks so pretty and feminine. See how nicely it fits together. I made the tag from the Forever Young cart, 2 pieces glued together with a little feather in between. 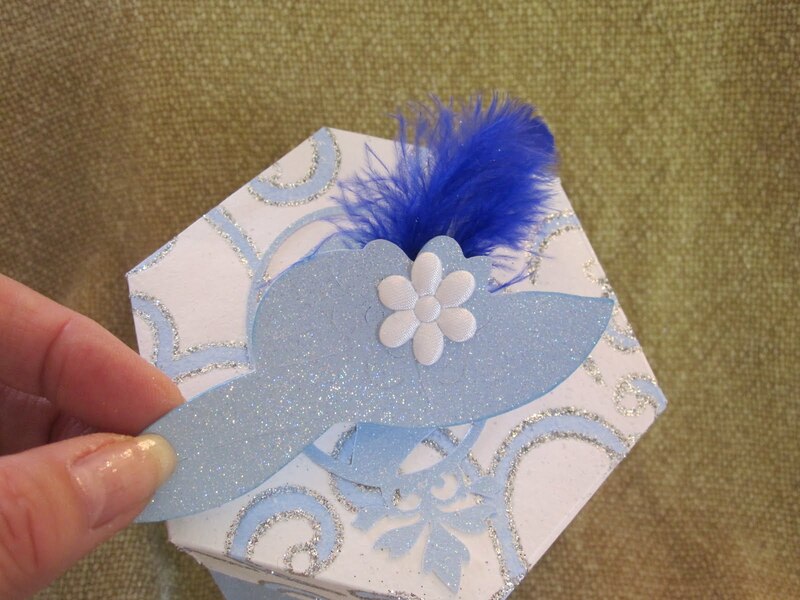 And of course the little hat will fit nicely in the box. I cut it from the scrap edges while cutting the box base. Added a little flower and it was good to go. 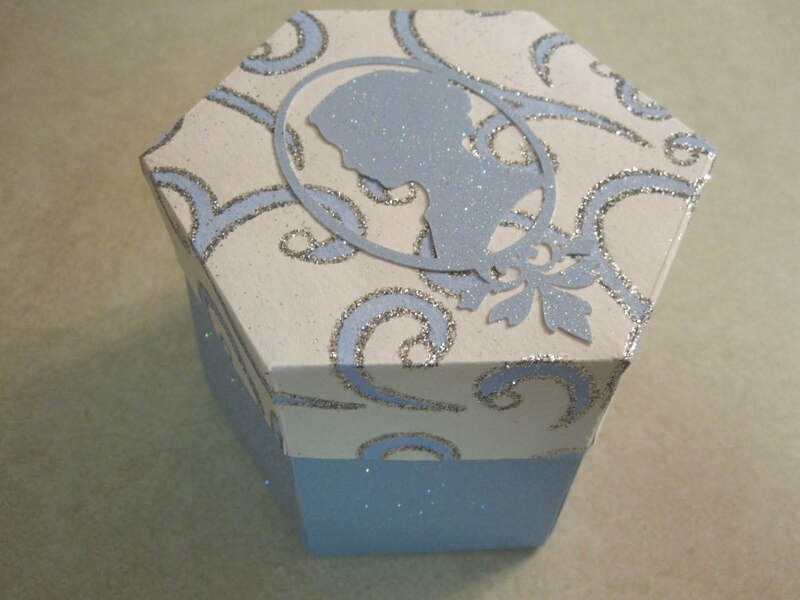 Don't you just love this little box? 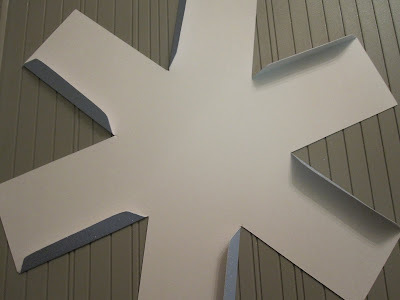 So easy, less than 5 minutes to cut and only about a 30 to 45 minutes to put together. 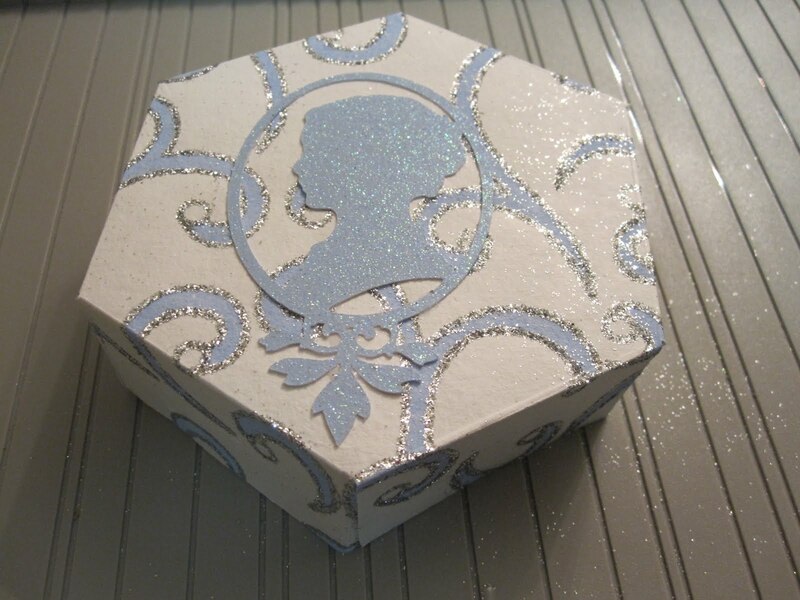 I want to thank Crystal aka MyaMagoo at Design~Create~Inspire for rescuing me and allowing me to share with all our Tuesday Treats and ShesASassyLady followers the opportunity to not only see for the first time this awesome box but to actually have a copy of this Magoo Hexagon Box Gypsy File!!! You are awesome MyaMagoo and I feel privledged to have presented one of your designs. Thank you for that opportunity! I am always encouraged by your sweet - sweet words. Your comments inspire me to keep scrapping and sharing things with you and that goes for both Crystal and myself! SHEILA!!! This turned out PERFECTLY!!! That paper is to die for...I wish we had a hobby lobby in Canada...oh well!! So pretty. I just love anything made with blue so combine that with a wonderful design and I am sold. So elegant! You both are very talented!!!!!! That paper is YUMMY!!! oh my! this is adorable! i wish i had the time and talent to make/design these cuties you guys show off. the colors go so well too. tfs! So cute! Great tutorial...love when we get step by step directions! wow. 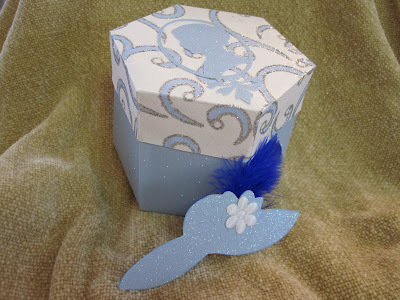 love the soft dreamy color which somehow goes with this shape box.. And now I know where chester flew off to. So beautiful!!! I absolutely love it and can't wait to cut one for myself!! Thank you so much for sharing the file!! I always love your projects! Great box and thanks so much for the cut file. Will have to try this one soon! Thank you so much for this post. I want to let you know that I posted a link to your blog in Creative Busy Hands Cricut Freebies Search List, under the Box, Purses, etc. post on Jun. 04, 2010. Thanks again. This is a cute box, love the colors!